The recent United States missile strikes against Syria could increase pressure on North Korea to give up its nuclear weapons. Or the missile strikes could show North Korean officials the need for nuclear arms to keep the country safe from attack. 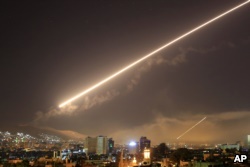 The United States, France and Britain fired 105 missiles at three suspected chemical weapons factories in Syria early Saturday. The allies said they acted to answer a reported chemical weapons attack in the Syrian city of Douma. The attack killed at least 40 people and wounded or sickened hundreds of others. The Syrian government has repeatedly denied any use of chemical weapons. The raid on Syria comes as U.S. and North Korean officials are preparing for talks in late May or early June. They are working on plans for a meeting between U.S. President Donald Trump and North Korean leader Kim Jong Un. U.S. officials want the North to discuss plans for ending its nuclear activities. North Korea is expected to demand security guarantees from the U.S. government. Observers say Trump’s decision to use force against Syria can be seen to support his “maximum pressure” campaign message. For the U.S. side, that means sanctions against North Korea, including a ban on most North Korean exports. In addition, the U.S. would take military action against the North, if necessary. The goal is to force Kim to end his nuclear program and the continued development of a nuclear armed intercontinental ballistic missile – one that could reach North America. On Monday, a South Korean newspaper, The Korea Joongang Daily, called the U.S. attack on Syria “a warning for Pyongyang.” It said that the North Korean leader must end his country’s nuclear program or face the same kind of airstrike. U.S. officials hope the show of force in Syria will increase pressure on North Korea to offer meaningful nuclear proposals at the leaders’ meeting. “The Trump administration will not be satisfied,” unless the North suspends at least some of its nuclear and missile activities, said Bong Youngshik. He studies politics at the Yonsei University Institute for North Korean Studies in Seoul. But the U.S. military strike on Syria could also increase concerns in North Korea that giving up its nuclear arms would leave the country defenseless in a similar attack. North Korea has long justified the need for its nuclear program by pointing to what happened to Moammar Gadhafi in Libya. The long time Libyan leader lost power and was killed by rebel forces, just a few years after he agreed to give up his country’s nuclear weapons. At the time, those forces were allied with the U.S. government and NATO forces. 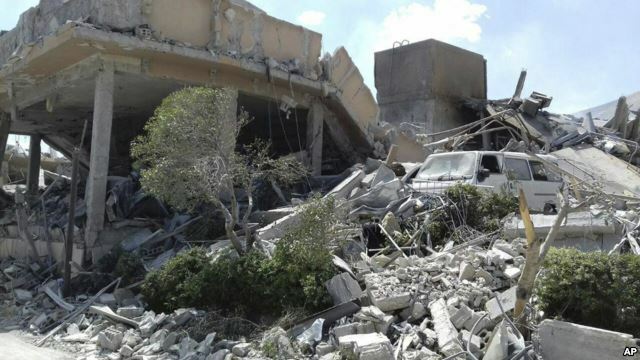 The U.S. and its allies justified their military action in Libya as a “humanitarian intervention” to prevent government forces from killing the civilian opposition. Without nuclear weapons, North Korean officials worry the U.S. could use the same humanitarian justification to intervene in North Korea. Kim Hyun-Wook noted “The U.S. can see North Korea as an autocratic state or human rights violator,” and then it can remove Kim Jong Un if he does not have nuclear weapons. The Kim government could use the missile strikes in Syria to demand a step-by-step system to end the nuclear program as a way to guarantee security. That would include the reduction or removal of U.S. forces in Korea over time as part of the required security guarantees. 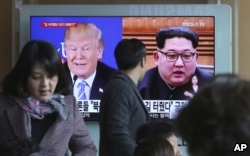 A man watches a TV screen showing file footage of U.S. President Donald Trump, left, and North Korean leader Kim Jong Un during a news program at the Seoul Railway Station in Seoul, South Korea, Monday, April 9, 2018. Major U.S. allies Japan, South Korea and Australia voiced strong support for military action to punish Syria’s reported use of chemical weapons and to stop other countries from using them. China, however, objected to the strike by the U.S. and its allies before an investigation and without the agreement of the United Nations Security Council. Brian Padden reported this story for VOANews.com. Susan Shand adapted his report for Learning English. George Grow was the editor.